The new range-topping Jaguar XJ packs the same 5.0-liter supercharged V8 as the ferocious F-Type SVR. Jaguar stole the show at this year’s Goodwood Festival of Speed with the surprise reveal of the XE SV Project 8, the fastest sedan ever built by the manufacturer boasting supercar performance. With the super-sedan gaining so much attention, you’d be forgiven for missing the debut of a new potent XJR wrapped in camouflage, which tackled the famous hillclimb circuit as part of its final testing before its reveal. Jaguar has now lifted the wraps off its new range-topping XJR575, hailed as the brand’s most powerful production sedan yet. Taking the 5.0-liter supercharged V8 from the ferocious F-Type SVR, the new flagship XJR575 packs 575-horsepower and 516 lb-ft of torque – that’s 25 horses more than the outgoing XJR. As a result, the XJR575 sprints from 0-62 mph in 4.4 seconds which makes it 0.2 seconds quicker than the outgoing model, and goes on to a top speed of 186 mph. Matching the luxury sedan’s potent performance are tailor-made exterior details including a rear spoiler, side sills, front bumper and lower air intakes featuring Gloss Black surrounds. 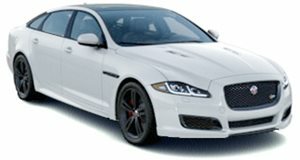 Further distinguishing the range-topper are 20-inch gloss-black wheels with red brake callipers, unique XJR575 badging, and twin hood louvres. The luxury range-topper is also available in two exclusive paint finishes: Satin Corris Grey and Velocity Blue. Inside, the luxurious cabin features adjustable bolsters for enhanced lateral support during cornering, as well as diamond-quilted upholstery with embroidered 575 branding, along with 575 branding on the dashboard intaglio and unique XJR575 front and rear treadplates. Also, a side note to Jaguar: premiering the XJR575 on damp runway using an overcast English day as a backdrop isn’t the most photogenic way to showcase a new flagship sedan. The entire XJ line-up has also received some technological and safety upgrades as part of its mid-cycle refresh before the new XJ debuts in 2019. As standard, every XJ model now includes full LED lights ‘J-blade signature’ daytime running lights and a large 10-inch touchscreen infotainment screen with 4G wi-fi connectivity supporting up to eight devices. It even has a handy ‘Commute’ mode which memorizes your daily drive to work and monitors traffic, suggesting alternative routes accordingly. There are also a range of advanced safety assists, including Forward Traffic Detection, which assists the driver when emerging from blind spots at intersections, Lane Keep Assist and a Driver Condition Monitor that detects when the driver becomes fatigued. Jaguar also claims its Autonomous Emergency Braking has “superior functionality” with its new Pedestrian Detection. At speeds of 3-37 mph, a forward-facing stereo digital camera scans for hazards and applies the brakes if a risk of collision is detected. No pricing details have been released for the US yet, but the new XJ range will go on sale in the UK this November with prices starting at £59,995 ($77,969). The range-topping XJR575 will cost £93,170 ($121,516).